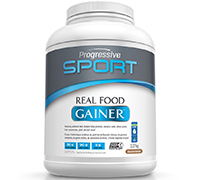 Featuring authentic New Zealand whey proteins, complex carbs, whole grains, fruit concentrates, plant oils and more! Ingredients: Maltodextrin, New Zealand protein blend (Whey protein concentrate, Whey protein isolate), Cocoa, Jerusalem artichoke, Brown rice, Sweet potato, Organic sprouted quinoa, Organic sprouted millet, Organic sprouted amaranth, Organic pumpkin seed, Avocado oil, Coconut oil, Flax seed oil, Tart cherry, Goji berry, Organic apple, Bitter melon, Pineapple, Papaya, Dandelion root, Ginger, Cinnamon, Xanthan gum, Natural & organic flavours, Organic stevia leaf extract, Himalayan sea salt. Suggested Use: For a delicious high protein shake, mix 2 level scoops (135g) of Real Food Gainer into 300ml of water, milk or juice. Consume at any time of day including before or after exercise.